The sea is the only way to get to any island; but in the ancient world it was also the best way to get anywhere. 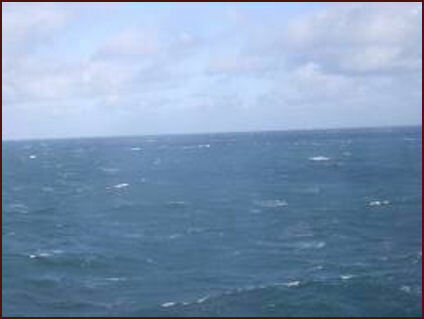 The Western routes from the Mediterranean went round the Western Isles of Ireland, through the Western Isles of Scotland, ultimately to Iceland. The early monks loved the islands and the sea. Many monks sought to follow Christ by leaving everything – clan, tribe and homeland in order to be an ‘exile’ for Christ (‘peregrinus’). They built their chapels and cells wherever they went and evangelised those around them. This accounts for the visitation and Christianisation of the Isles which we will now explore all up along the Western seaboard of Scotland. We find at least 26 saints, over 50 sites and over 200 martyrs! The south and western areas of Scotland begins with the Gaels (Irish) or Scotti, but these were for a time subject to the Picts (8C), the Vikings (9C) and in the far north, the Norse 9C+. The Kingdom of Scotland (Alba) came into being through the unification of the kingdoms of the Gaels and the Picts in 10C, and the slow integration of the Northern Isles from 13C -15C. 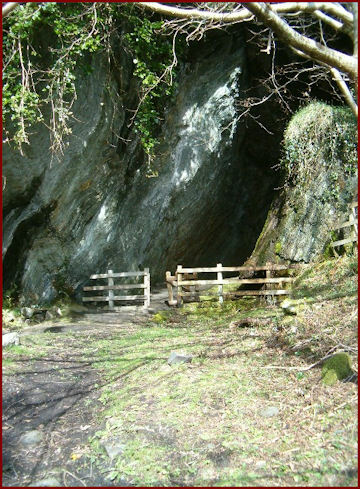 The Irish St Molasie (650) lived in a cave by the sea on ’Molaise’s Isle now called Holy Isle, close to Arran. 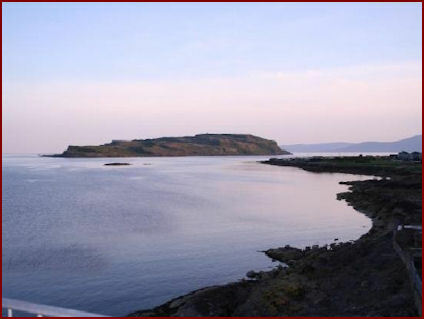 The Irish St Mirren (6C) founded a monastery on the island of Great Cumbrae in the mouth of the Clyde. St Beya, a 7C Northumbrian, evangelised Little Cumbae next to it and pictured above. 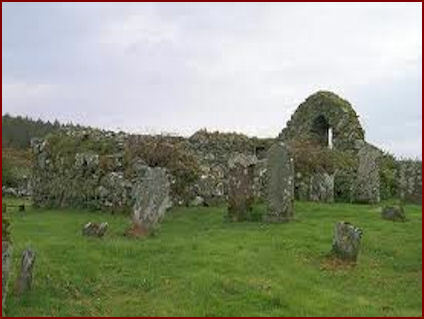 The Irish St Mochta founded a monastery at Kirkton of Kilmahew (‘Church of Mochta’) on the north side of the Clyde. The church here has been rebuilt. Old Kilpatrick on the Clyde was a Roman settlement and may also have had a Christian one. 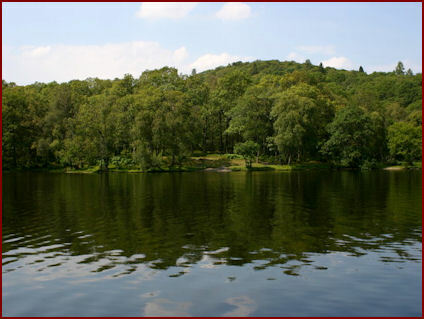 The Irish St Kessog (6C) took another isle, Inchtavannach, in Loch Lomond. 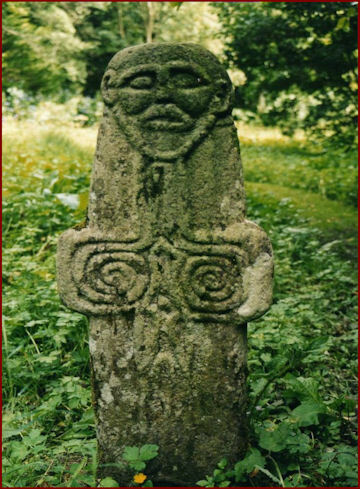 At nearby Luss there is a remarkable 6C carved head of the Saint. ended his days at Roseneath on Gare Loch as a hermit. Kingarth at the end of Bute. The present chapel is 12C. and at Kilmarnock further down the Firth of Clyde. 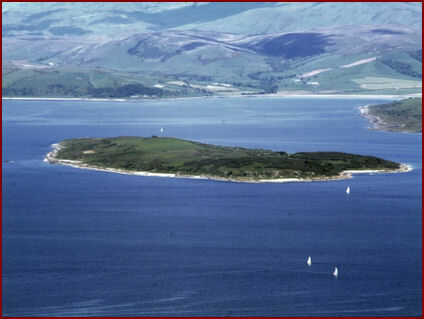 St Catan also founded monasteries on the island of Gigha (above) , on Colonsay, Luing and Lewis. But he may have ended his days back in Ireland. 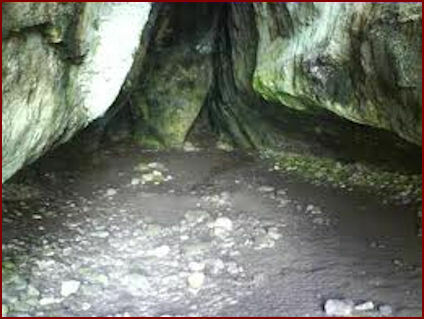 St Columba may have landed first at Ellary just off the sound of Jura and spent some time in this magnificent cave. 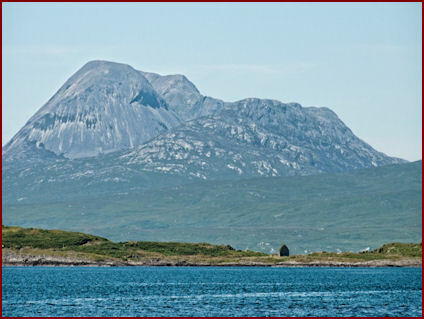 The little church is dwarfed by the Paps of Jura. 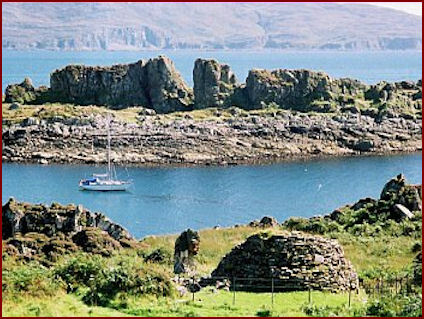 St Cormac also founded a sizeable monastery at Keills on Knapdale. Keills is derived from the Manx word for a small simple chapel, Keeils, of which there are many on the Isle of Man. 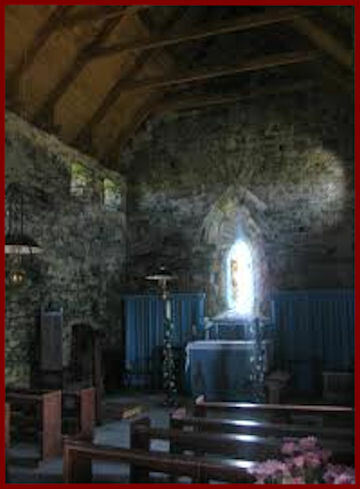 There are also chapels of this type on Islay. 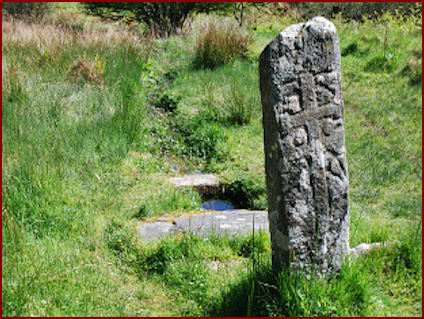 The Holy Well is all that is left of the now deserted village but Kilmory Knapp nearby is home to many carved slabs. St Maerubha also went further north to Applecross. 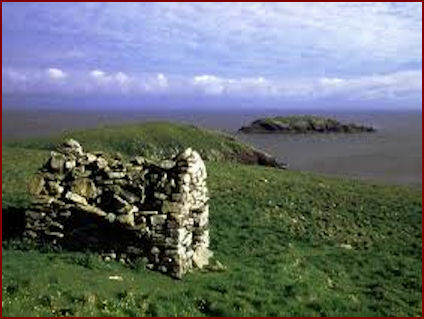 The Irish St Brendan built a bee-hive oratory here on one of the Garvellach Islands in the Firsth of Lorne, c 542, before St Columba. There are 2 chapels a grave and graveyard and 3 crosses. The oratory door and partly holed roof can be seen on the left, with a standing stone in foreground. St Kenneth stayed on Iona. 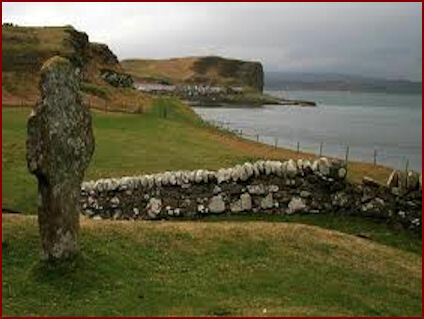 He founded a monastery on the island bearing his name close to the island of Mull in the Inner Hebrides. 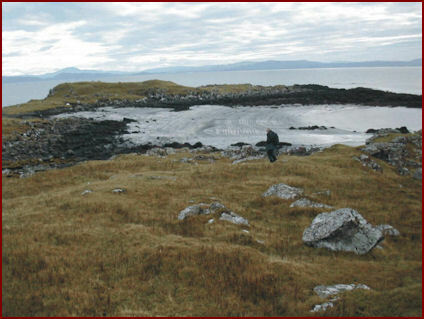 The island provided grain for Iona. 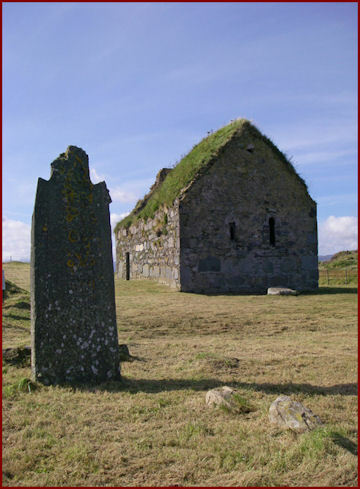 Missionaries from Iona planted several churches on Mull. In spite of the depredations of the Reformation, the old Holy Well and Tree behind the church at Kilninnian can still be seen. A 7C chapel was discovered at Tobermory in 2010.
with restored abbey buildings behind. 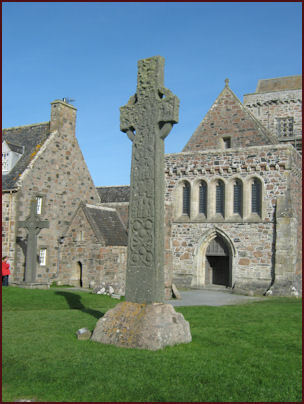 Iona took pride of place in the coming of Christianity to Scotland, though it was not the first place to which it came. 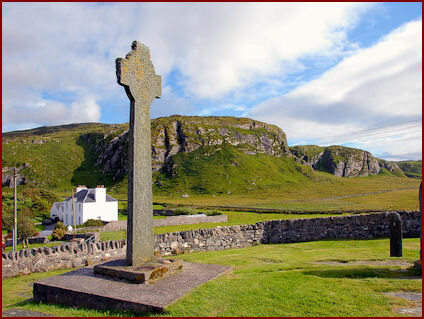 St Columba left Ireland with 12 monks to found the monastery in 563. 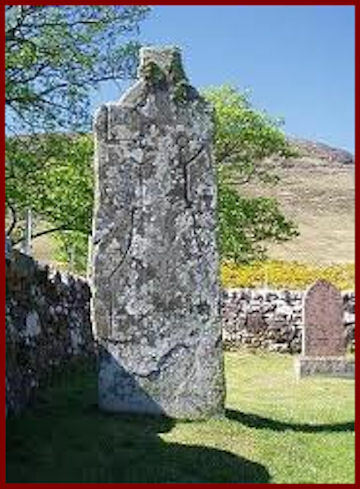 It became a major centre in ministering first to the Irish of the Kingdom of Dal Riata and secondly to the Picts. It also became a very important centre for learning and sculptured crosses. 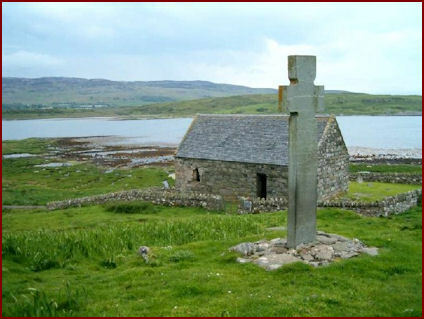 The site of St Columba’s cell, of his shrine, and 2 of the great crosses, can still be seen. The first buildings would have been equally simple made of wattle and daub, and later in wood. 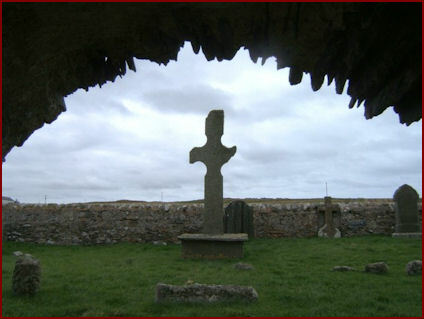 The12C chapel of St Odhran (548) stands in its original burial ground. 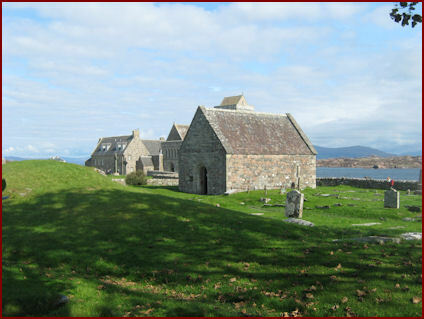 Iona was plundered many times by the Vikings; 68 monks died in 806, St Blathmac in 825. It was finally abandoned in 849 when the monks returned to Ireland. 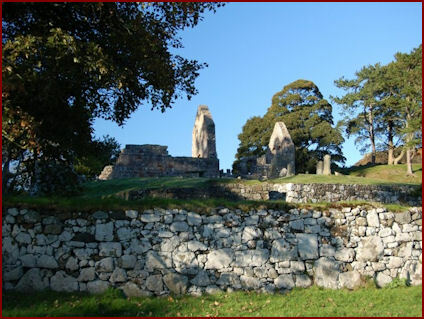 The monastery became important in the new Kingdom of Scots known as Alba. St Ronan’s convent of Benedictine nuns was set up in 1208 and had 400 nuns. It lasted til the Reformation. At that time 357 out of 360 of its carved crosses were destroyed. 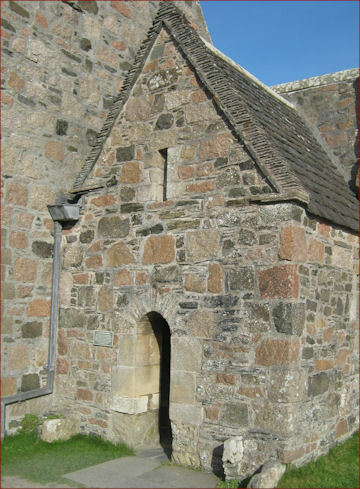 The site of St Columba’s cell, – a hut on planks – lies right in front of the Abbey. The 8C St Martin’s cross may be the earliest of all carved crosses. St John’s Cross 8/9C, perhaps the most ambitious of all crosses ever made. The original is in the museum. 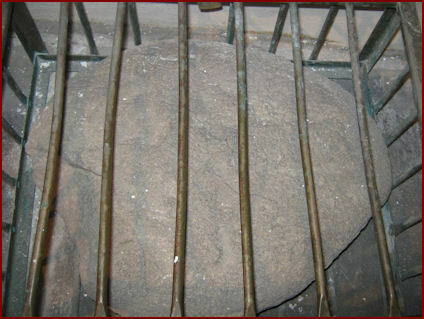 which he may have used and which may have been used in his tomb. which meant it had to be out of sight from Iona. Islay (Eye-lah) is west of Jura in the Inner Hebrides but at only 25 miles away Rathlin Island in Ireland is visible on a clear day. 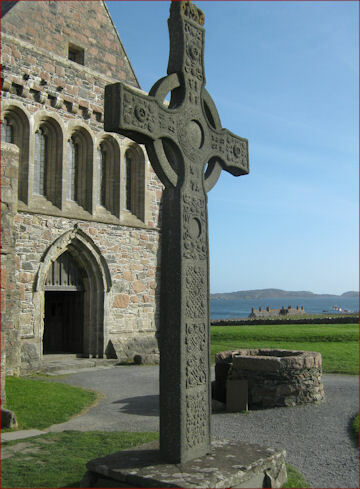 Missionaries from Iona, including possibly St Columba’s relative St Baithne, brought the Gospel here. In due course stone crosses were erected. 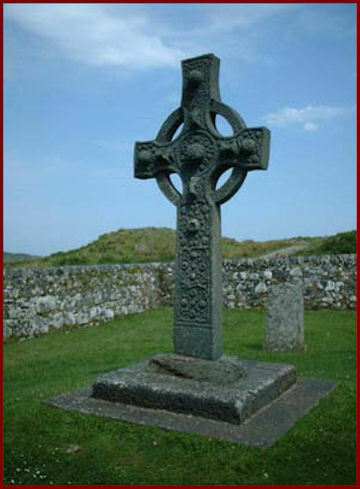 The Cross at Kildalton, on the east side of Islay, one of the earliest and finest of carved crosses in existence, was carved from a single piece of stone. 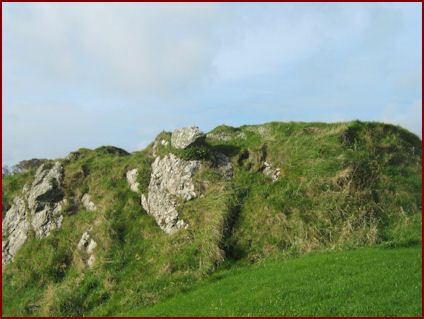 This little island just off the west coast of Islay probably had a monastic cell. 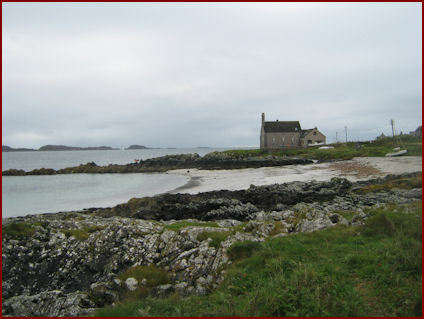 This remote island abutting on Islay may be ‘Hinba’ where a community of hermits lived and which St Columba used for a retreat. St Ernan, his uncle, died there. This is an amazing piece of carving showing 8C Irish influence. But of whom? Christ? An Apostle? A Bishop? St Patrick’s Oratory is on the south tip of the island. St Kenneth and St Comgall also have foundations here. 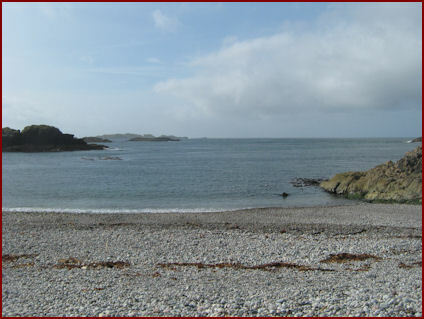 St Baithene, Abbot of Iona founded a monastery at Soroby or Kirkapol about 565. Tiree also provided food for Iona. 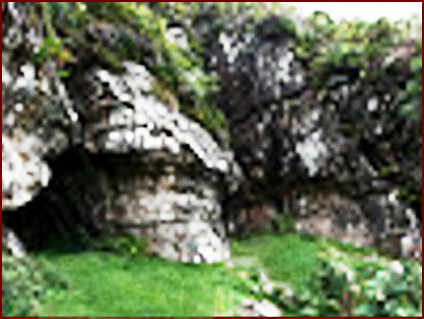 The Irish St Moluag (6C) established an important centre on the island of Lismore in Loch Linnhe outside Oban. He also established a church at Kilmaluag on the island of Raasay, another at Kilmaluag Bay, Trotternish Skye, and also on Mull, Tiree and on the Isle of Lewis. 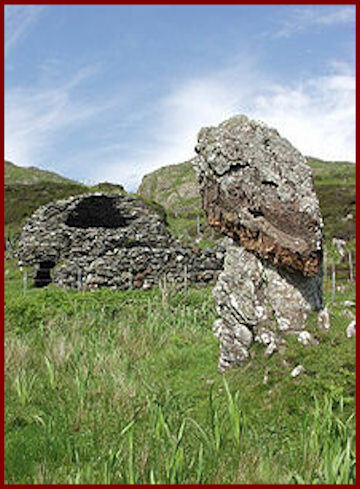 St Maelrubha was also among those who planted churches on Skye. The Small Isles lie between Mull and Skye. The monastery at Kildonan was founded by an Irish missionary, St Donnan and perhaps 50 monks were massacred in 617 by raiders. 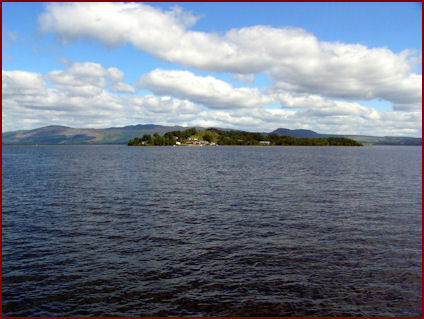 St Finan (7C) had a cell on an island at the south end of the Loch which he used as a base in his missionary endeavours. The unfinished High Cross at Applecross. Perhaps the Vikings were on their way? 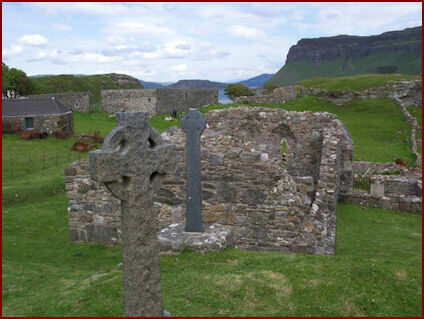 St Maelrubha founded a monastery among the Northern Picts in 672 on the Applecross Peninsula in Wester Ross opposite Raasay and Skye. The monastery was very remote, access being only by sea. Even today the road journey is very long and scary. There is a 15C cell in the churchyard near where, somewhere, it is said the saint is buried. He travelled much round the west coast founding many places. 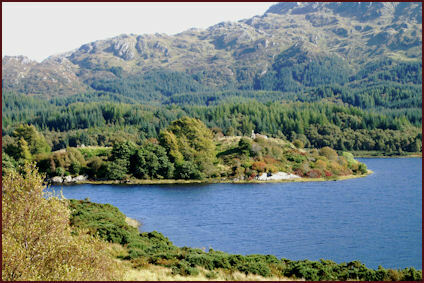 He built a hermitage on Isle Maree in Loch Maree which is named after him. He died in 722. Barra is the southernmost inhabited island of the Outer Hebrides. It is named after St Finnbarr who was probably a 7C Scot. Barra survived Viking days, as a cross with Norse runic inscriptions testifies. It is predominantly Gaelic speaking and managed to remain Catholic. 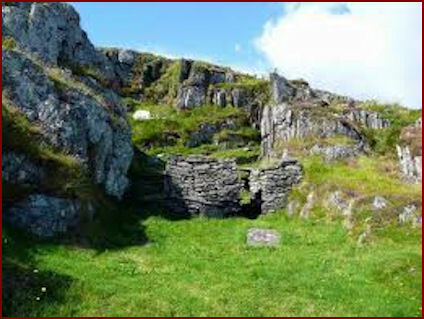 The current ruins, on an early site, are 12C. The re-roofed St Mary’s chapel is still used for services. 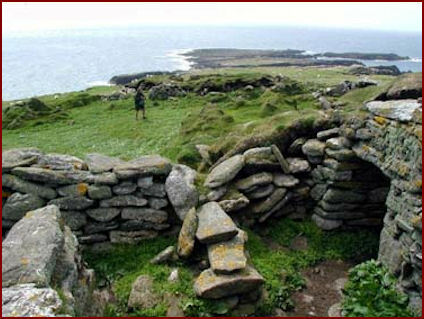 It is possible some of the small islands such as Pabbay (’hermit’s isle’) Barra and also Pabbay Harris, were used by hermits. Here the Living Tradition is very close. 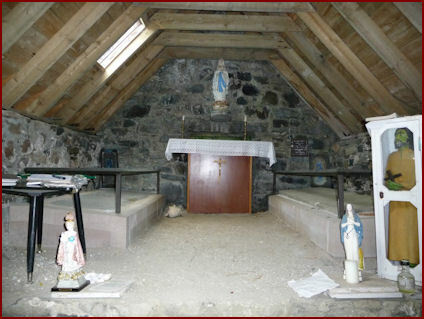 St Brendan had a chapel on Vatersay on the west coast on the tidal island of Uinessan. The numbers of sea-going Irish were probably far more than we think. St Moluag (6C) also founded a church at Europie on Ness in the northernmost part of Lewis. The church (Church of Scotland) fell into ruin but has now been beautifully rebuilt. Again one feels the Tradition is near. A Columban monastery was built where St Catan was said to have had a hermitage at Aignish, a tidal island on the Eye Peninsula East of Stornoway. St Ronan spent time on Lewis before going to the island of St Ronan 44 miles north east of Lewis. His cell can still be seen. 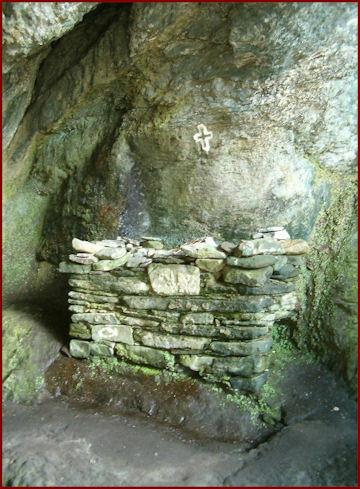 St Brendan had a chapel on Hirta one of the St Kilda islands 40 miles West of Lewis. Next stop: Orkney, Shetland, the Faroes and Iceland.